Practice calligraphy, scribe creative stories, or record your life history on ancient paper, then roll up your scroll to keep the contents safe! Rolly Scrolly's long sheet length is perfect for group art projects. Encourage students to use stamps and rubbing plates to create colorful artwork, practice cursive writing, write down their life histories, and then hide their scrolls in a time capsule. 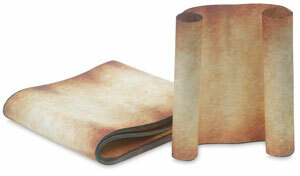 Rolly Scrolly is pre-printed on both sides to look like "ancient paper." Includes 32, 7½" × 35¾ ft (76 cm × 15 m) sheets and an idea guide.